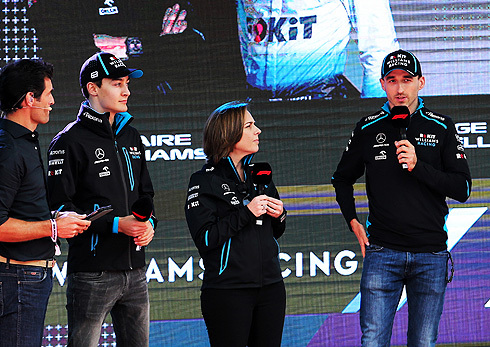 The recent 2019 Australian Grand Prix would see both ROKiT Williams drivers complete the race but their performances were such that both would finish over two laps behind the leader. The weekend was one of further struggles for the Williams team as they come to grips with the lack of pace from their 2019 challenger the FW42. For various members of the team they would come away from the race with somewhat differing viewpoints of the race and the results achieved. Both drivers Robert Kubica and George Russell would have their own opinions on the race. Deputy Team Principal Claire Williams and Senior Race Engineer Dave Robson also offered their views of the race. For Robert Kubica his race was marred by losing his front wing after having made contact with Gasly. This would see him pit and lost a huge amount of time as a result. Robert was able to finish the race but would finish of the cars running in last. Going into the race Robert was the focus of much discussion regarding his return to Formula One after a lengthy break and also coming back having recovered from his injuries to his right arm. Some doubted his ability to come back with all these considerations coming into play. But Robert when asked about this said that he had no regrets about his return even under the circumstances of been in a very uncompetitive car when no doubt he expect better from the FW42. He felt that the fact that he was back in F1 outweighed any other concerns. In a recent interview with Autosport.com Robert said: "I knew it would be an extremely difficult challenge for me to be back in such a competitive sport and being on the grid, and I knew it might be difficult for Williams. "But I didn't expect to come to Australia so unprepared. "[That's] not from a physical point of view but from a lack of driving. For me, before testing, Barcelona would be the most important days of the last eight years as a driver - although not as a person, when I was in hospital and couldn't walk. "As a driver, there haven't been more important test days in my life from the driver point of view as Barcelona. "Unfortunately Barcelona didn't work out at all. "So it put me into the difficult position, but somehow I have to go through them here, in Bahrain, and probably for a couple more races. "But I hope and, from what I can see, I think I cannot regret. Even if I struggled here, I still enjoyed it, which is a big difference compared to long time ago. I am not an emotional guy but after the race, it felt like a great achievement." For team-mate George Russell his first race in Formula One would see him finish one place ahead of Robert but would have a far less eventful race coming home without any issues after going through the process of managing his race and carrying out his first race pit stop. But for George there was no concerns of his ability to perform as he has come of a season that saw him win the 2018 Formula 2 championship. His only issues were those that come from been a rookie. George was able to finish ahead of his team-mate in the majority of practice sessions as well as qualifying. But he still had to deal with the lack of pace that his team-mate also had to contend with. But after the race George would admit that Robert was his only benchmark given the lack of pace from the FW42. George said: "From a personal perspective, you've only got your team-mate to compare against." "Obviously I'm not disappointed to have come out on top, but at the end of the day I'm not interested in fighting him for last. We need to work together to make this right." "And obviously it wasn't a fair fight with Robert; he had a bit of damage at the start. So for both of us it was just bring the car home and just learn as much as we can." "We've just got to treat these as test sessions because we're so far behind, and we've just got to understand it and almost try things to see what works and see what doesn't, because for now it doesn't really make much sense to try and optimise everything when we are that far off the pace." For Claire Williams the results of the race were obviously not where she had hoped to see the team after the first race of the season But she did find time to praise both the teams drivers even with the results. Claire would say in an interview with Autosport.com: "Both George and Robert have done a very good job for us this weekend." "I'm happy with both of them. "We knew it was going to be tough, we knew we were going to be at the back. "But as I said to the team, people are still watching us, it's still important that we come out and do the best job that we possibly can. "We got two cars home, and we did great pit stops, and we did good strategy calls, and that's all we can ask for at the moment. "The most important thing is we got a lot of learning out of it, there's a lot of information now that we can go and analyse to make improvements." The final team member to comment of the Australian race was Senior Race Engineer Dave Robson. Having been forced to take up the role that Paddy Lowe would have filled but was on a leave of absence Dave would make it very clear that it was a great result to get both drivers to finish the race and for the team to manage the race for both drivers. Even so he still acknowledges that there is a massive amount of work for the team to do in order to move into the midfield battle. Dave said: “It was a tough day as you would expect but it was an achievement to bring two cars home. Robert had an unfortunate first lap, but once we got him back out with a new front wing he was able to settle down and he drove a good race on his comeback. “It was George’s Formula One debut and he has had a solid weekend all round and now has his first race under his belt. This should give both drivers some confidence moving forward. Overall even with all the negatives that the team had to contend with both prior to, during, and after the race inside the team there is still a feeling that for the Williams team and their drivers the race had not been a complete waste of time far from it. It was the first step in what unfortunately is going to be a difficult recovery. The length of this recovery is still the concern that the Williams team has to contend with.